Loved it. Dr. Rubio was great. Very friendly, not judgmental. Explained everything to me. I would highly recommend. Very kind and knowledgeable. He didn’t try to scam me into anything and everything was fast and efficient. I would recommendhim to anyone! Very kind and knowledgeable. He didn’t try to scam me into anything and everything was fast and efficient. I would recommend him to anyone! We love taking care of our patients and educating our patients. We enjoy seeing children and adults. We accept majority of dental insurances. InStyle Dental offers late appointments and Saturday appointments. InStyle Dental strives to make our patient’s feel at ease, while providing premium dental care and exceptional customer service. Dr. Francisco Rubio is a fun and compassionate person who enjoys enriching people's lives through their smiles. He was born in the Rio Grande Valley but led much of his childhood migrating to northern states with his migrant parents for seasonal agricultural work until he graduated high school. 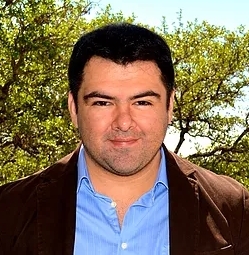 Dr. Rubio earned his undergraduate degree from The University of Texas Pan American before attending The University of Texas Health Science Center at San Antonio to earn his dental degree. Dr. Rubio is a movie fanatic and enjoys watching all types of film genres. He is also a spurs fan and enjoys watching the San Antonio Spurs rack up points on the court. Dr. Rubio enjoys music of different genres from Pop to Country. After a long week, you can catch him riding his bicycle through out Leon Creek Greenway Trails. If that wasn’t enough bicycle riding, Dr. Rubio indulges in motorcycle riding in the open country with Fredericksburg and Medina Lake being some of the final destinations. Dr. Rubio enjoys Mexican, German, Mediterranean, and Middle Eastern cuisine but can be easily persuaded to choose pizza over anything. Dr. Rubio also enjoys unwinding with his wife Dr. Nazanin Ghahremani, family and friends over brewed Chai tea and stirring up old memories while creating new ones. They have Saturday hours which are so important for my family. They went out of their way to assist me with my two toddlers while we were all in the office getting separate check ups/cleanings. The office is extremely clean andthe TVs are a nice touch. The equipment is state-of-the-art. The staff is warm, inviting and pay attention to details. Although very nice staff and dentist. My cleaning was done very quickly and I didn’t notice any difference. The dentist didn’t even try I was in and out in like 10 minutes. Would not go back. Dr. Rubio’s Office was such a delight. Great staff from front to back. They made me feel welcomed and kept me informed through the whole visit. I am excited to go back and complete my work we have planned out. Let’snot forget to mention the TVs in the room. Definitely like the big screen in front of the exam chair and the screen on this ceiling for when they lay you back. Really cool.